Sunday March 13th 1921 I was at home all day. Read some and took a sleep in afternoon. Edith to church and Laura to San Jose to a funeral. Monday March 14th 1921 I talked with Vene in forenoon and went up town in PM. I was at Lizzie Duncans awhile. Gertrude is sick. I had a letter from Hattie and Robs picture. Lydia played in evening. Tuesday March 15th 1921 I read some. I do not feel very well. Slept in afternoon. All at home in evening and Lydia played for us. 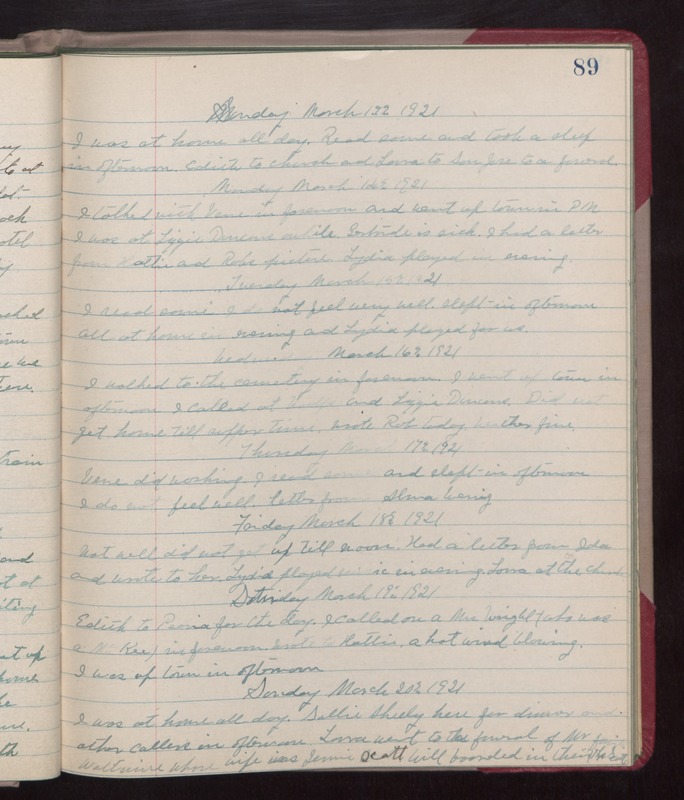 Wednesday March 16th 1921 I walked to the cemetery in forenoon. I went up town in afternoon. I called at Woolfs and Lizzie Duncans. Did not get home till supper time. Wrote Rob today. weather fine. Thursday March 17th 1921 Vene did washing. I read some and slept in afternoon. I did not feel well. Letter from Alma Wenig. Friday March 18th 1921 Not well did not get up till noon. Had a letter from Ida and wrote to her. Lydia played music in evening. Laura at the church. Saturday March 19th 1921 Edith to Peoria for the day. I called on a Mrs Wright (who was a McKee) in forenoon. Wrote to Hattie. a hot wind blowing. I was up town in afternoon. Sunday March 20th 1921 I was at home all day. Sallie Sheely here for dinner and other callers in afternoon. Laura went to the funeral of Mr Waltmire whose wife was Jennie Scott. Will boarded in there (the Scott family).